I always wake up with a feeling that I want to cook or bake something. But sometimes, I really don't know what I really want to do, haha. Maybe I just want to play in my playground (or you can call it kitchen), that's the real reason. 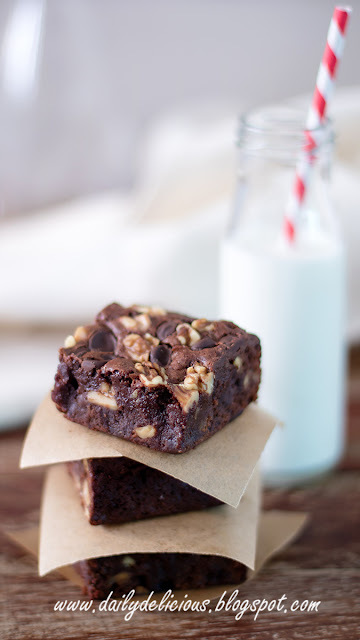 But I don't let my time goes by, when I don't know what to make, Brownie is the first thing that comes to my mind. 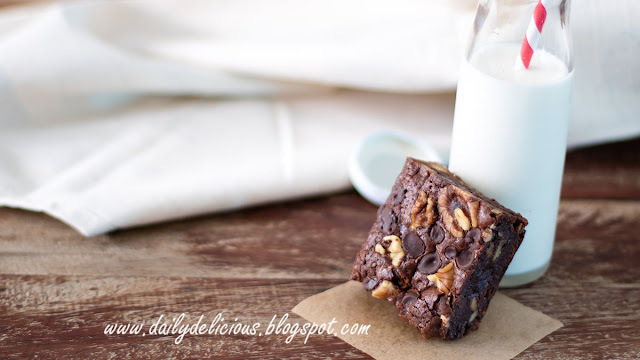 It's easy, delicious, and everyone loves it! 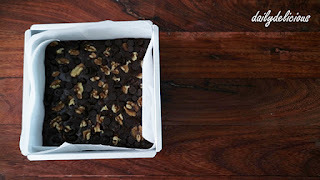 This time, when I think about making brownie, I want to make brownie that my brother will love it. 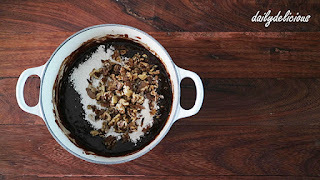 And the answer is easy, I have to put a lot of nut into the batter (well, he doesn't like too bitter or cakey brownie, he loves nutty and fudgey one). So, I put load of walnut into the batter and add an extra to the top. 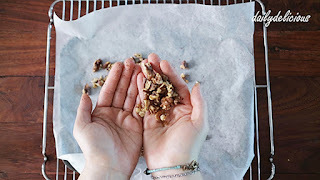 You can play with different kinds of nut if you want, as I love to say, home baking is the best because you can do it the way you want. 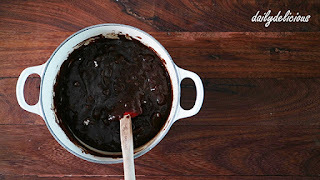 I use 60% dark chocolate, and get delicious result but you can use less or more percentage, depend on how you want your brownie to be. 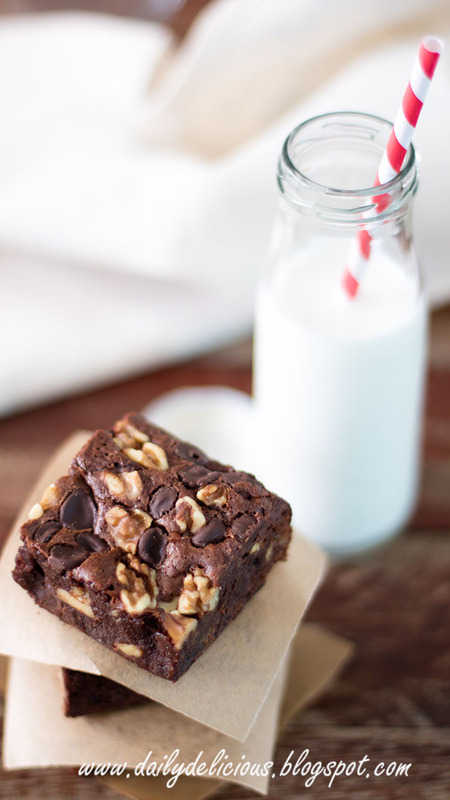 I can't say that the most expensive chocolate will make the brownie more delicious but the one that you like will be the right answer. 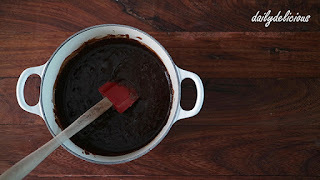 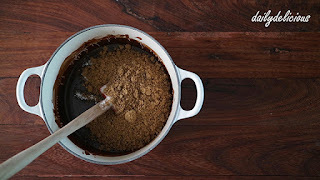 The texture of the brownie is one of the trickiest thing, but you can control it by yourself, and the baking time is the key, longer and the brownie will be drier, so you will get cakey one, and shorter for fugdey. 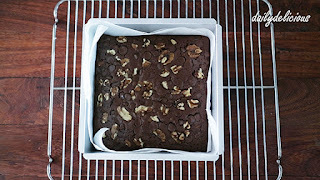 Line a small baking sheet and 18x18 cm pan with baking paper. Pour the walnut (A) into the prepared baking sheet. Let them cool before using. 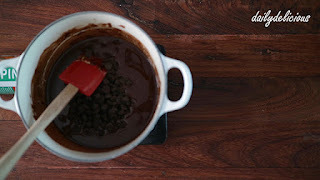 Put the butter and unsweetened chocolate into a pan. 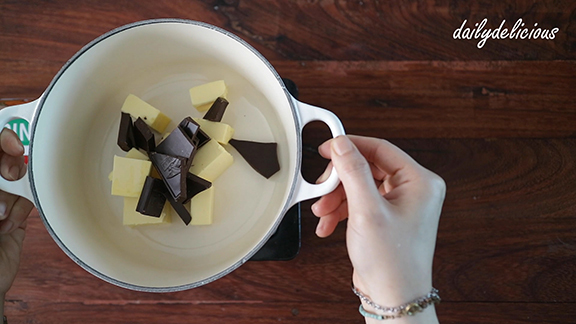 Place the pan over low heat. Stir until melt, pour the dark chocolate into the pan, stir until melt. Remove from the heat, pour both of the sugar into the pan, stir to combine. Pour eggs and vanilla extract into the pan. 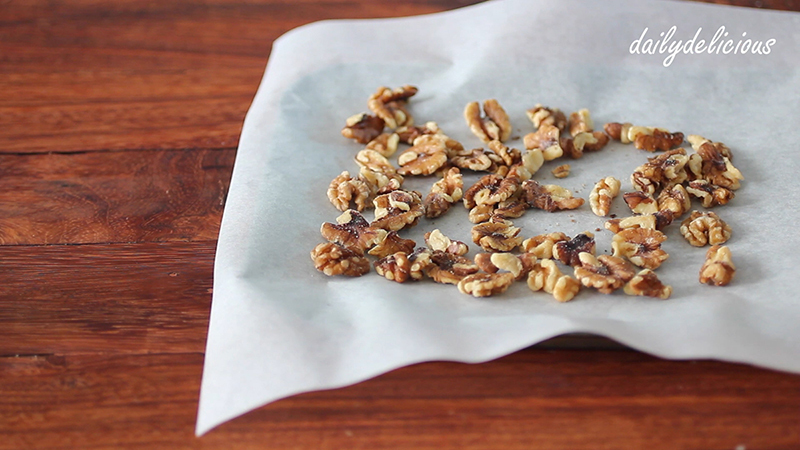 Pour sifted flour and baking powder into the pan with roasted walnuts. Pour the batter into the prepared pan, and smooth the top. 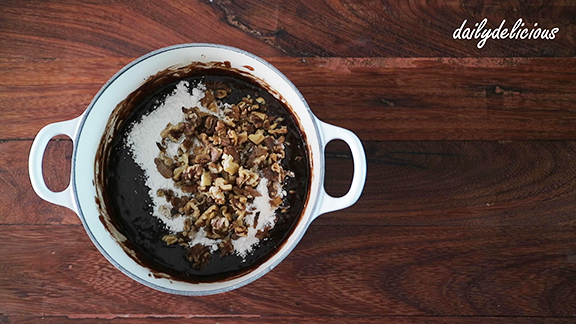 Sprinkle the walnuts(B) and chocolate chips over the batter. 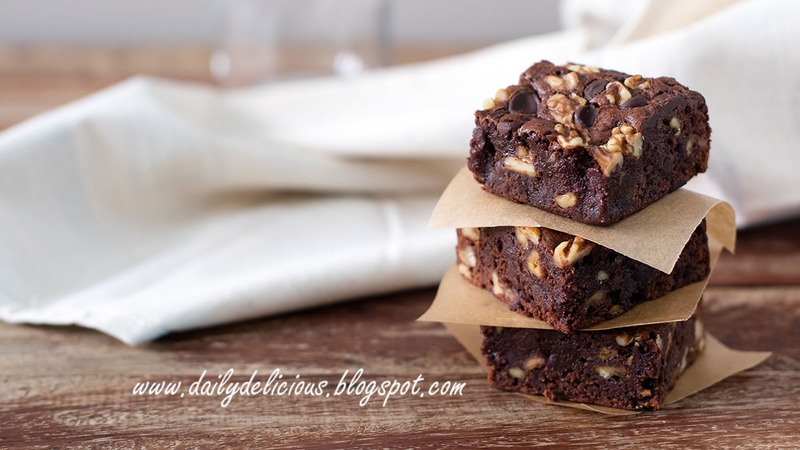 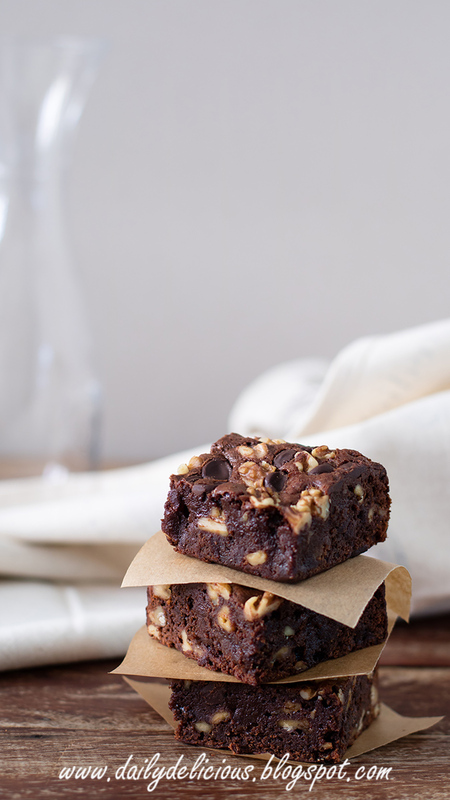 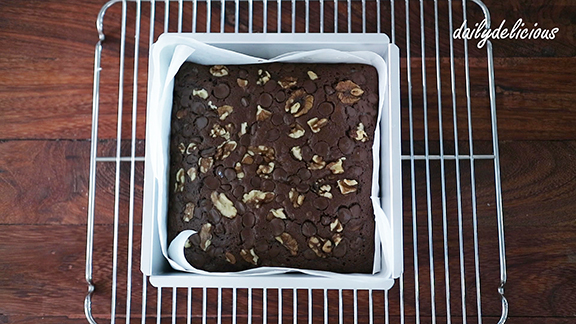 Bake for 25-30 minutes (or depend on how you like your brownie ^^). Let it cool before cutting into pieces.